If summer 2012 was a season of weather misery, 2013 has been the opposite. Almost every ECAA Albion League match has been shot in warm sunshine and (generally) light breezes this year – shorts and sunglasses essential. Truth be told, many of the team eschewed the club colours in favour of plain white shirts: our distinctive red polo tops being too warm under blazing sunshine. 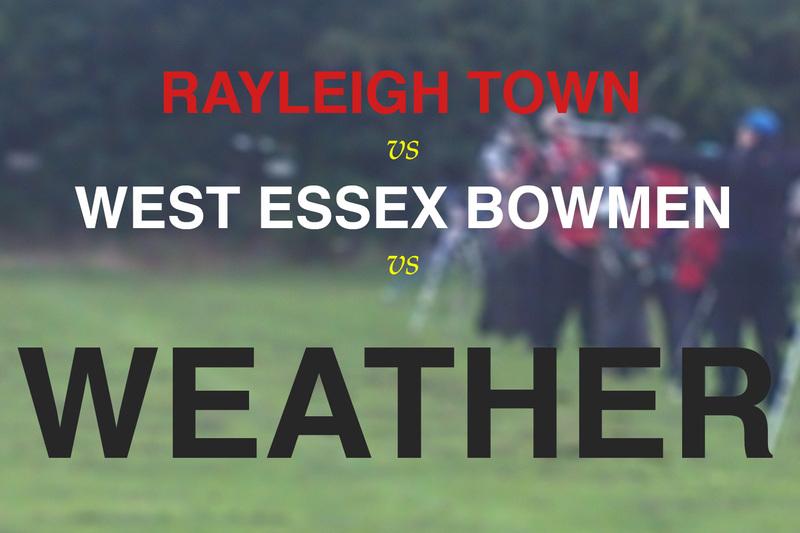 Rayleigh were fielding more archers today than for any of our previous matches: Andy and Geri (fresh from European field shoots), Jackie and Grant, Paul Isaac (making his team debut), captain Ian, Charles, Brian, Jim, Grant and Tim. After Ian made his selection of 8 archers to represent the club today, Paul, Brian and Jim would be shooting alongside at the west end of the field (which, it turns out, was by far the best place to be!). The top 5 scores from the team of 8 would form our total. West Essex’s team captain welcomed us to their field at Belhus Park near Upminster wearing sunglasses – had the forecasters got it wrong? A packed shooting line (including archers from Noak Hill and Oakfield shooting ‘B’ and ‘C’ matches) certainly hoped so – but after introductions and a touching minute’s silence for one of West Essex’s members who had recently passed away, shooting started at 80yds in a strengthening breeze and with high cloud forming a dense gloom above us. We all hunkered down for the approaching storm and there was a definite sense of purpose – we had to clear this distance in short order! 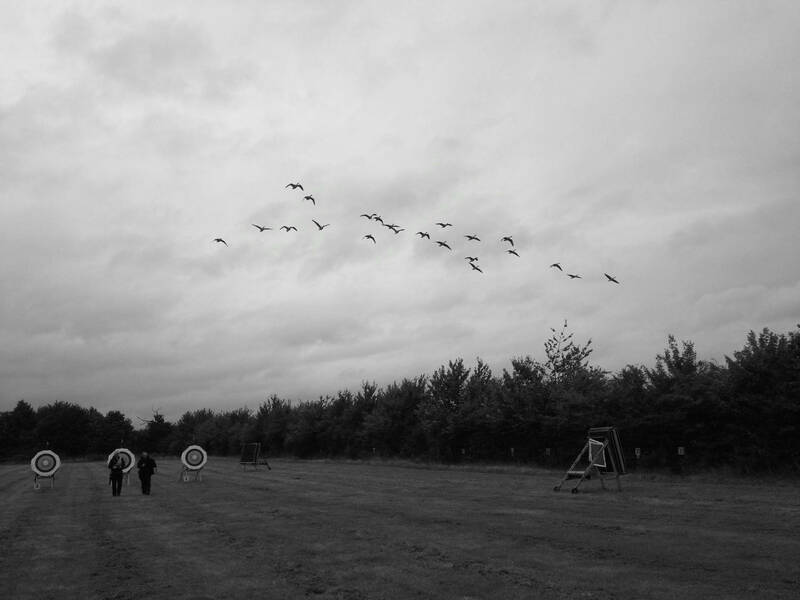 As expected, groups were somewhat spread out as we battled the strong South Westerly wind causing problems both on the line and at distance – archers swaying and arrows corkscrewing in flight, drifting off target into the wet grass. Amid the cursing and shaking of heads we were treated to a low-level air display from a Spitfire, launched from the nearby airfield, making laps around the park. Later, and sure sign that autumn is approaching, a gaggle of Canada geese flapped over us on their way to feeding grounds. Eventually 80yds was complete. The team convened for a debrief: Andy’s tooth was giving him a bit of trouble, but he resisted Grant’s offer of pulling it out. Brian broke out the performance-enhancers from the coolbox and handed round Guiness and ginger beers. But the big news was that Paul had shot a blinder, scoring 250 points at 80yds – a fabulous achievement given the conditions. Would his focus and resolve hold out to the end…? A quick lunch and chance for a ‘comfort break’ at the nearest conveniences (a good walk away, down a muddy puddled track) and we were back in at 60yds. The wind was changing direction but somehow giving us more frequent periods of respite: there were definite breaks in the breeze. Now, however, we had to contend with the first downpours – light at first, then increasing. Those bright warm early days of summer long gone! In little over an hour, the 60yds stint was complete, targets moved up and archers struggling for warmth before going again at 50yds. The rain wasn’t letting up: coming down harder and harder for what seemed like most of this session. How much to adjust for the weight of water on arrows at such a short distance? The wind, too, wanted to get back into the action, buffeting tired arms struggling to maintain stability. 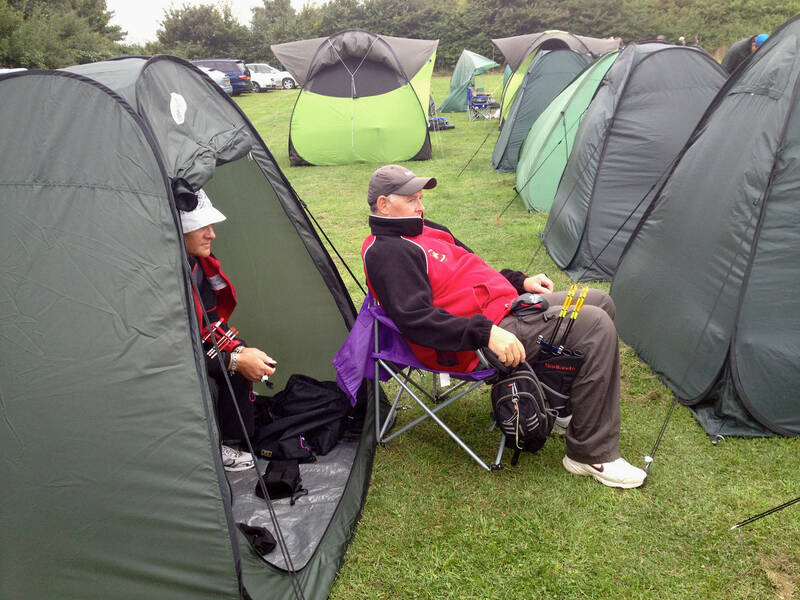 It was, however, a great relief to shoot the final arrows of the match, and the outdoor season, in something approaching dry conditions: the showers eventually stopped and we could relax. Confidence was high that we might have clinched this one as Team Captain Ian B went off to tally the results. After such a stormy return to UK shooting, Andy and Geri somehow managed to hold it together to the end: most of the 8 team members had kept to the high 700′s but newbie Paul had indeed kept his resolve and finished with a brilliant 804 points! Fantastic shooting, and the second-highest (but unfortunately non-contributing) score from Rayleigh which must earn him a regular spot on next year’s squad. Another close-run match won by RTAC by a 150-point margin! A really satisfying close to the League fixtures, despite (perhaps because of) the weather. We now wait to see how we fare among the other teams but Ian is happy we should be staying up in Division 1. High-fives and backslaps all round for the team: every match has been great fun and our scores reflect concerted efforts to return Rayleigh to the top of the County league. Thanks especially to captain Ian B for keeping us all on track throughout 2013 – here’s looking forward to even more success in 2014! * Banner background pic by Brian – hope you don’t mind me blurring it, Brian! ?